You help me know that I'm okay. Even when life is sucky. 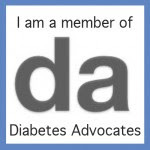 Life is hard enough without all the guilt that surrounds diabetes. Thanks for sharing this and hugs to you. Love you, lady--it's okay to be not okay, and very okay to seek help. Sending love and hugs, Jess! I've had too many of these days in the past. God bless you. Thank you for sharing your experience, and being real. This episode does not diminish my admiration for you. Sharing your experience enhances my admiration for you. Sorry you had to experience this, but I'm glad the new day was better. This week marks three years since I first met you face to face at an airport in Kansas City. Sitting here watching "Ordinary People" today has reminded me just how much your honesty and selflessness has meant to me personally. You're an absolutely amazing person in all of your imperfections. Just as you went out of your way to make me feel important all those years ago, I wanted to send some love your way today. While so much water has passed under the bridge since those days, I'll never forget what you have done in my life and always value you as an amazing and very special friend. So many of your posts still resonate with me and as I stream through my playlist it seems nearly every song reminds me of some conversation we had in the middle of the night (for me) and I can't help but smile. So I giess I just want to say thanks again. Thanks for being the amazing, sharing person that you are. Thanks for giving so much of yourself and for all the help you've been to me and so many others.